365 Questions You Need to Ask Her. Your mom is so much more than the woman who raised you. She grew up in a time very different from yours—there were different beliefs, habits, and ways of doing things. 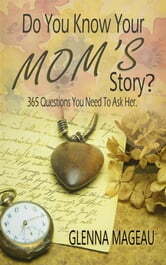 Your mom has seen a lot in her life, getting to hear her journey will help you to understand her in a whole new light. Now is the time get to know her and to document her life. The only way to find out about your mom's story is to ask… because one day she won't be there anymore. This book offers a way to start conversations between you and your mom—in particular, elderly mothers. It is a guide which provides questions to ask, as well as how and when to ask them. Use this as a way to grow, heal and/or mend the relationship between mom and child; preserve this woman's journey through life and in particular her role as Mom. Her story is her legacy to you. Books related to Do You Know Your Mom's Story? Don't You Dare Have Kids Until You Read This!